This article shows you how to perform the most common project management tasks in iRise Definition Center, including creating, importing and sharing projects. Create a new project by clicking on the 'Create New Project' button on the My Projects page in your Definition Center. A 'Create New Project' dialog will appear and ask you to name your project. Simply name your new project, choose whether you wish to create Screens & Diagrams, or User Stories & Requirements, and select either a blank project or choose from one of the many libraries. and click 'Create'. Your new project will be opened in the editor and ready for prototyping. You can search for a project in the navigation bar. As you search, you'll see a list of projects containing the text. Either select the individual project or press enter to see a list of project from your search term. You can create a project directly in the Definition Center web interface by importing an iDoc. Once the project is imported, you can perform a variety of tasks including various export options and moving the project between folders. This article has further information on the various ways of importing and exporting projects as iDocs. In order to collaborate on a Definition Center project, users must be given permission by the project owner to access the project. See this article for further details on Sharing projects with other users. A Reviewer is somebody that has been given access to one or more projects on the Definition Center. They can review and comment on a simulation they have been 'invited to'. Once a user is created on the Definition Center, an owner of a project can then add a Reviewer to their project with View/comment permissions. Select the checkbox to send a notification, and the user will get an email with a link to the project. The invitee will receive an email notifying them they have been added to a project, their permission type, and a link to the project. They will need to log in in order to access it, (unless public projects are being used). To delete a project, navigate to the folder location of your project, then click on the checkbox next to the project you wish to delete. Click on More Actions button > Delete. 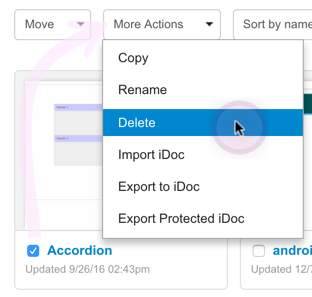 You can select multiple projects to delete by clicking on multiple checkboxes. Note: this action can't be undone! Only delete if you are sure!